Kefir has a long history related to its origin which tells that it was invented accidentally by residents of Caucasus Mountains centuries ago. 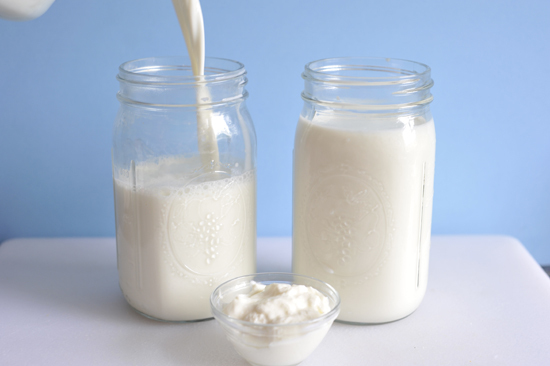 Kefir milk is traditionally made by fermenting milk with kefir grains. In fact they are not grains but living bacteria that look like cauliflower florets. Kefir Milk has many health benefits including a perfect gut! So pave your way to health with this easy to make drink at home. Take coconut milk in a jar at room temperature, add in kefir grains, stir gently and cover the jar with a paper tissue or muslin cloth. Seal it with a rubber band and put it at a warm place to ferment for 24 hours. Uncover the jar and strain the fermented milk through a fine plastic sieve in a bottle or jar. Note: Reserve residue from sieve for next batch of milk to be fermented. It can be used again for fermenting. Keep the filtered coconut kefir milk in refrigerator. It will looks like something between yogurt and buttermilk. When ready to serve, remove from fridge and add powdered sugar. Serve chilled. Tip: You may sprinkle some cardamom powder in the milk just before serving. You may also make this drink with regular milk.